Take full control of the keystrokes sent by the Enterpad. IT managers —offer your employees a useful tool to increase productivity and reduce errors. Software developers —offer a total package with the addition of the Enterpad. The AHK Enterpad saves precious time for those who need to frequently trigger AutoHotkey scripts. Make the most of your AutoHotkey knowledge and create time-saving shortcuts that minimize mouse movements and keystrokes. Have you ever dreamed of a way to easily run dozens of VBA macros? No keyboard shortcuts to remember, no buttons that clutter the screen. 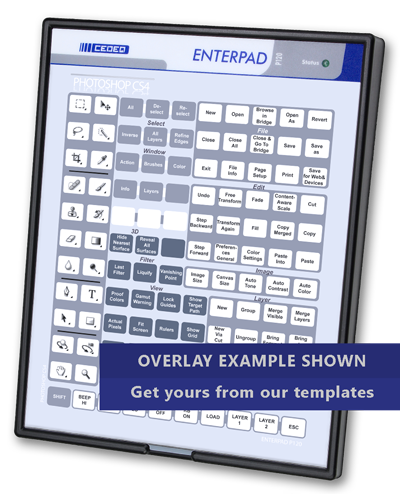 We developed the Enterpad VBA for you! We make custom shortcuts so you can work faster and be more computer-efficient. An expert will install shortcuts on your Enterpad in no time at all. Up to 120 shortcuts! We will program your shortcuts and reprogram them if need be! Free estimate. Not satisfied? You don’t need to sign up! A key partner in office efficiency for over 20 years. A developer of custom electronics and software for office automation, Cedeq meets the needs of people who want to improve how they work on a computer or machine. With this in mind, in 1990 Cedeq created Enterpad, a computer device designed especially for programming shortcuts.